If you have been seriously injured in a slip and fall accident caused by a dangerous condition on a commercial, residential, or public property, a civil litigation attorney with personal injury experience can explain your rights, answer your questions and help you to pursue compensation. Please contact our office to schedule a free initial consultation. Slip and fall cases typically involve some dangerous condition that the defendant either knew about, should have known about or actually created. For example store owners have a duty to inspect their premises to ensure that it is safe for customers and to remedy any potentially harmful conditions. If an unsafe condition, such as standing water, is not remedied, customers can be severely injured and store owners may be held liable. Additionally, if you are injured while on private property and the injury is due to some dangerous condition the owner knew about or should have known about, his/her homeowner’s liability policy would likely cover any claim. 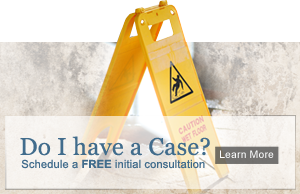 At Iler & Iler, LLP, we help our injured clients pursue premises liability claims against negligent property owners. In fact, we devote a significant amount of time to ensuring that our clients fully understand their situation. We feel this approach enables them to make prudent legal choices and determine the best course of action. Slip and Fall cases have important statutes of limitation that must be complied with in order to protect your rights. Don’t let this important deadline pass, call Iler & Iler, LLP today.